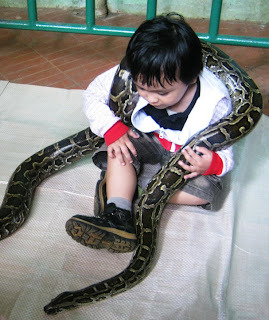 A photo session with this snake was offered around the snake area at the Ragunan Zoo (Jakarta, Indonesia). The cost is very cheap, less than $1. At that time, I noticed that only kids who were interested. Kids with their curiosities! 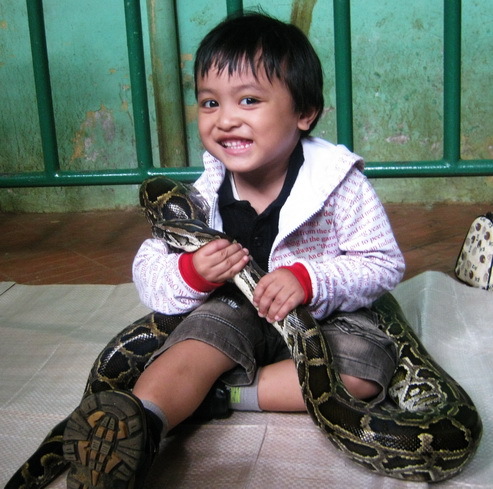 Based on Wikipedia, reticulated python is a species of python found in Southeast Asia. Adult ones usually grow to an average of 3-6 meters (10-20 feet). Like all pythons, they aren’t considered dangerous to us, humans. Look at its complex pattern; it’s amazing, right?